At last, Apple introduced multitasking apps on iOS 9 for iPad, which means you can work with more than one application at once. An app called SplitView lets you pull two apps up in a (you guessed it) split screen, either in a 50/50 or 70/30 split. You’ll be able to scroll both apps simultaneously. There’s a feature called SlideOver that lets you swipe another app in from the side, and Picture-in-Picture is exactly what it sounds like: You can keep a little viewer in the corner while you go about your Twitter stalking. There’s also a cursor now: If you put two fingers on the keyboard, it’ll work like a trackpad. 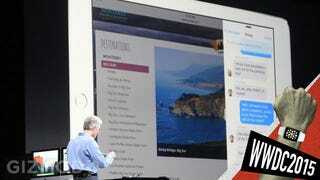 SlideOver and Picture-in-Picture will be available on the iPad Air and up, Mini 2 and up. Split View is only for the iPad Air 2. These features could be a warm-up for Apple’s upcoming batch of iPads, since the next model is expected to be super-sized and perfect for keeping more than one app pulled up at once.